This was a most fascinating exhibition which was too late for some people who were the concubines and slaves of the early Chinese Emporers. Unfortunately they were victims of ‘retainer sacrifice’ being put to death to serve their leader in the afterlife. 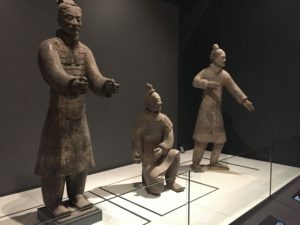 The Emporer Qin Shi Huang must have thought he would have had no fear of being attacked by enemies when he buried a terracotta warrior army to accompany him in the afterlife. The figures date from 210-209 BCE (Before Common Era) and vary in height according to their rank. 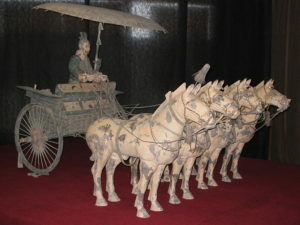 Also included are chariots and horses. An estimated 8,000 soldiers 130 chariots and 670 horses are included in the pits, which also contain officials, musicians and acrobats. It was also interesting to see from depictions and models how the army was created, of course the work force must have been enormous. Differentiation between the ranks and occupations eg swords man or use of bows and arrows was intriguing also. Despite a few hiccups, coach breaking down on the way there and traffic hold ups on the way back, we reached home safe and sound having enjoyed a good day out.